In the autumn months, spectacular leaf colour ignites the Botanic Garden, but particularly in the Autumn Garden where plantings are selected to brighten misty autumn days. Here stunning foliage combines with late flowers, seedheads, fruits and feathery grasses to create a richly textured tapestry. 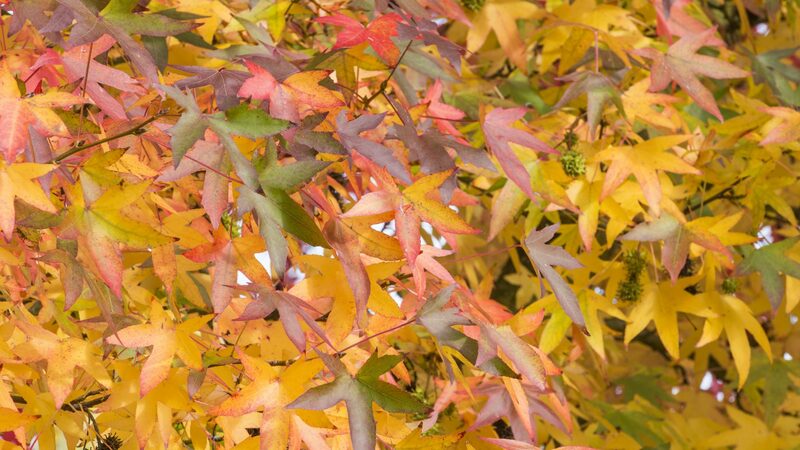 Some of the best displays of fiery autumn foliage are provided by the Sweetgums, Liquidambar styraciflua ‘Worplesdon’ from America and the related L. orientalis from Turkey. Different species of Smokebush (Cotinus) provide a tapestry of reds, clarets and oranges against which the frothy plumes of the spent inflorescences are highlighted. 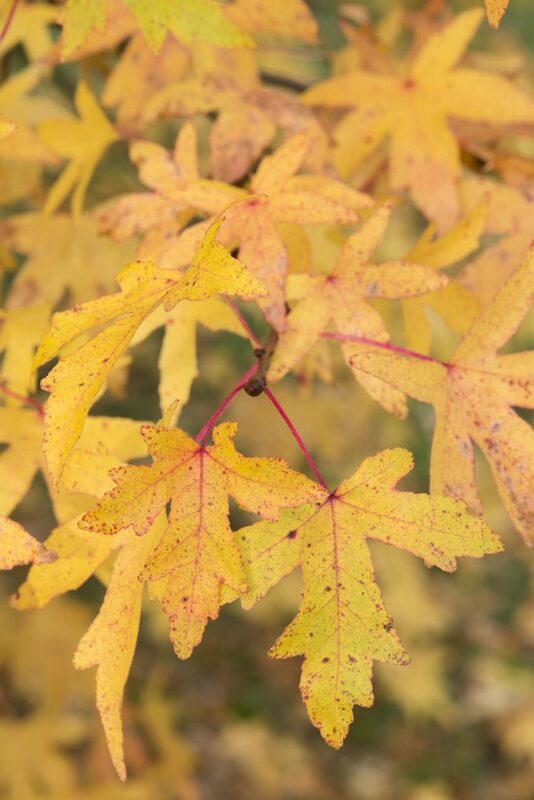 Other autumn leaf colour comes from many Acer species, including a trio of Acer palmatum ‘Osakazuki’. 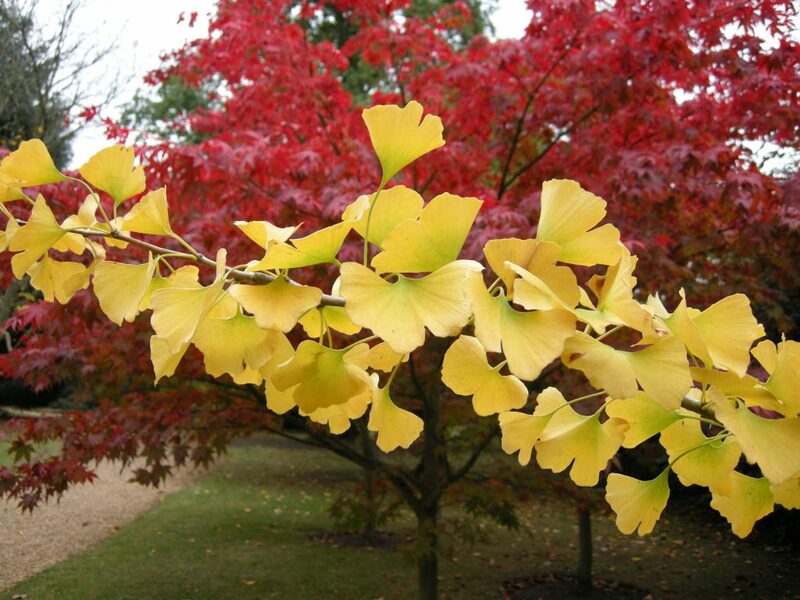 The palmate, seven-lobed leaves take on intense red colourings as autumn progresses, making a vibrant contrast to the butter-yellow, fan-shaped foliage of a neighbouring Maidenhair (Ginkgo biloba). The soft, feathery foliage of the deciduous conifer Metasequoia glyptostroboides, or dawn redwood, adds coppery russet tones. The herbaceous plantings also bring late colour and form. The dense platform flowers of Sedum spectabile x S. telephium ‘Autumn Joy’ provide valuable platforms for feeding bees and butterflies amidst the cone flowers of Echinacea purpurea ‘White Swan’ and the slender grass Calamagrostis x acutiflora ‘Karl Foerster’.